NaturesCool facilitates the exploration, understanding and enjoyment of nature through publications, school visits, summer programs, and environmental education support. Nature's cool at this nature school! NaturesCool publishes children's nature books and presents nature programs for kids. Owner and operator, Garry Pfaffmann, is passionate about kids, education and nature. For the past 20 years, he has intertwined these interests as a naturalist, certified teacher and published author. Garry currently teaches middle school at the Aspen Community School in Woody Creek, CO. Writing books is fun, but Garry's real joy comes from sharing the passion of creativity and exploration in nature with others. For 20 years, Garry has been teaching nature education programs to kids and adults. 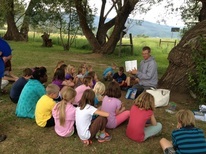 See Garry's summer program schedule for activities in the Roaring Fork Valley, or contact him to schedule an author visit at your school or public library.